Add a sweet touch to your ham with this pineapple glaze. 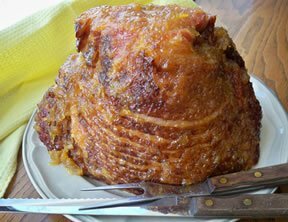 You will have a delicious ham with a slightly sweetened flavor that is perfect for Easter or any special occasion. The spiral cut ham makes it quick and easy to carve for serving. Let us show you how easy it is to roast a rack of Lamb. See step-by-step how to create a Guard of Honor with two racks of lamb. See how easy it is to carve a rack of lamb. Use the same technique on a Guard of Honor and Crown Roast.